Posted by Candie Kates on Apr. 11, 2017 17:35:13. LG smartphones are quite popular in all over the world these days. The brand LG is made in Korea but it has been taken over to the international market recently. One of the major reasons why people prefer to buy LG phones is due to its higher specifications with cheaper price. Especially, with the new LG G2/3/4/5 phones, you can take pictures, store music and videos in highest qualities and with internal 32 GB storage, it gives you the opportunity to store a lot of data on your phone. But the nightmare begins when you accidentally delete the data from your phone and unable to recover them. As time goes on, you will have tons of important data, documents, images, memos and so on in your phone that you can't afford to lose them. But data loss may occur for various reasons, you may lose data during software update or you may accidentally delete them as well. But never fear, as usual we have the right solution to fix the problem. In this short tutorial, we will learn how to retrieve deleted data from LG phones without having any technical knowledge. With the rapid growth of smartphone user base, there are many new services and apps being developed to feed the gap. One of the prominent fields is data backup. You can find a lot of apps for backing up data for LG phones. In one word, if you ever backed up your phone with any of those apps or services, you can directly restore the deleted files from backup. Below is a few examples. 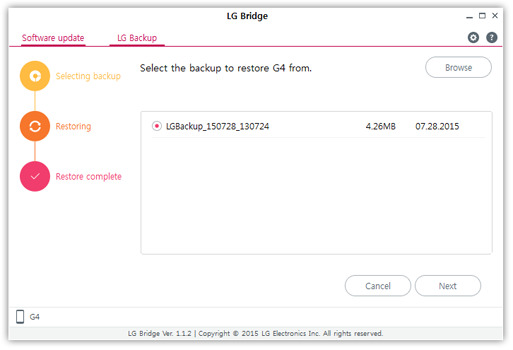 Restore from LG Bridge Backup: LG Bridge (formerly known as LG PC Suite) is the device manager app developed by LG official. You can backup and restore the device in a few steps. Simply launch the program on your computer and choose 'Restore' tab. Then the backup file will be scanned automatically. At end, select the files you wish to restore. 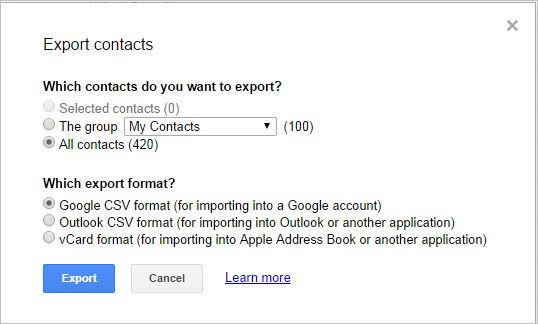 Restore Contacts from Gmail: Gmail is the most widely used mail service on Android based devices. 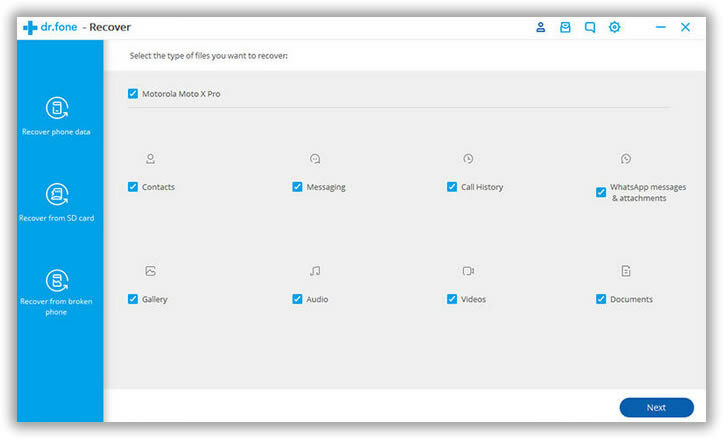 Once you signed in with the account, the contacts will be synced automatically. When you accidentally delete contacts from your LG phone, you can find the deleted entries from Gmail web page. Restore Photos from Google Drive: The most preferred way to backup photos is via cloud storage such as Google Drive, Google Photos, Dropbox or OneDrive. The deleted photos are still on the remote server and you have the chance to download them directly from the web page. 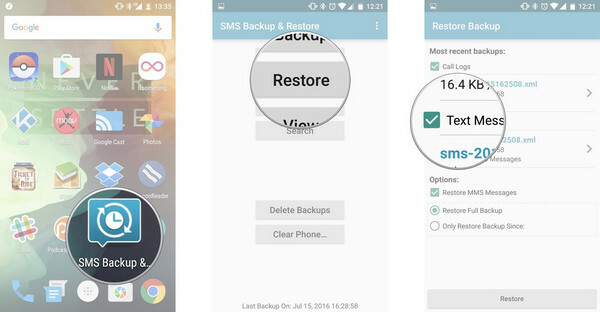 Restore Text Messages from SMS Backup App: Unlike photos or contacts, people have large chance to backup text messages because it can be only done via third-party apps such as SMS Backup & Restore, SMS Backup +. Once you backed up SMS with the app, you can find the restore option from the app. Just tap on it, and then all previous messages will appear on the phone. However, the biggest drawback of the above methods is that it will overwrite the data before the backup date. It means new data will be missing if you prepared to recover the deleted items. If you were concerned about this, then you should use Android Data Recovery software instead because it is not only recover lost data but also keep the new data on the phone. If the above tips didn't work, then that's where Tunesbro Android Data recovery software comes into play. 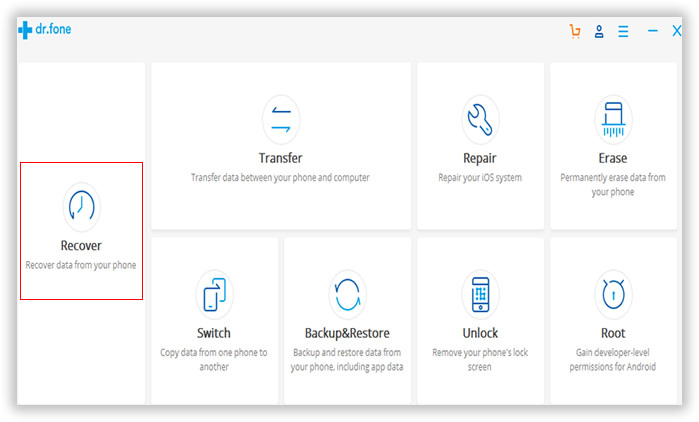 Tunesbro Data Recovery is a desktop utility that helps to recover deleted data from LG phone or any other android smartphone or tablets. Not only you can recover deleted documents but also it can recover deleted photos, music, videos, messages, and contacts and so on. So without waiting, let's get started on how to recover deleted data from LG phones. In this short guide, we will learn how to recover deleted data using data recovery software. So first of all, you will need to download Tunesbro Data recovery software from their official website. The software is free to try, so there is no worry to pay anything before your satisfaction. After downloading the software, simply follow these steps to recover deleted data from your LG phone. It literally takes few clicks on your mouse and you will get back all your important data back on your phone. After downloading the software from the official website, you will have to install it on your computer. The installation process is pretty self-explanatory. Simply read the instruction and install it on your system. After installation, it's time to launch the software for the first time and you will be able to see the main interface of the software on your display screen. Now, connect your LG phone to PC using a USB data cable and let the software automatically detect your phone. 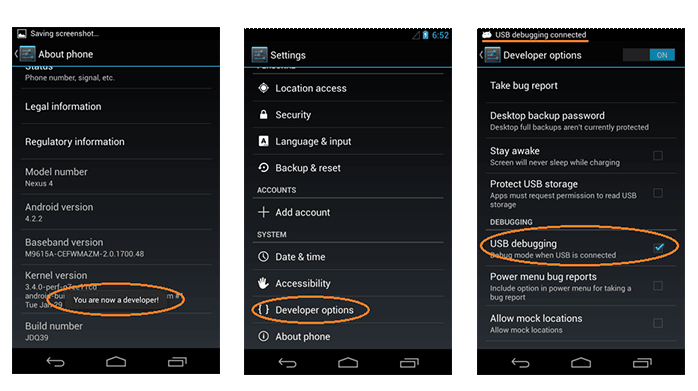 It is recommender to turn on the USB debugging mode on your phone so that the software can work properly. If everything is done correctly, you will be able to see the following screen that says your phone is ready to scan. Now simply click on "Next" from the bottom of the software screen and let the software scan your entire phone for deleted files. Please note that this process may take several minutes depending on how much data it is scanning. During this process, it is recommended to keep your phone connected to PC. Meanwhile, you can work in background without any problem, it won't interrupt the software whatsoever. After the scanning process is finished, it will let your preview all the deleted files on your LG phone in a well-categorized manner. You will be able to preview each and every deleted file on the software by its own file type. Navigate through each tabs and check which files you wish to recover. Simply click on each files and then click on "Recover" and the software will restore all files to the output folder for your choice and then simply copy them on your phone and you will be able to get back all the files that you have deleted. In above short tutorial, we showed how to recover deleted files on LG phones. You can use the same software to recover data on other android phones as well like Samsung, Nexus and so on. 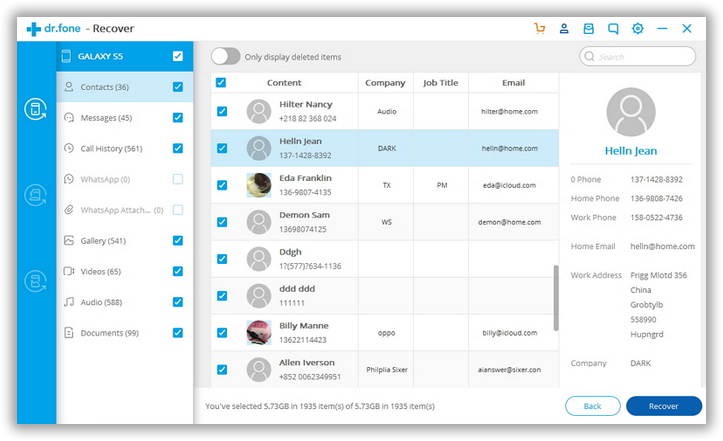 There are many tools in market that offers the same feature but you may consider Tunesbro Data recovery software over them as it is tested and proven in countless phones and if you run into any trouble then their support system will be happy to help you at your earliest convenience.